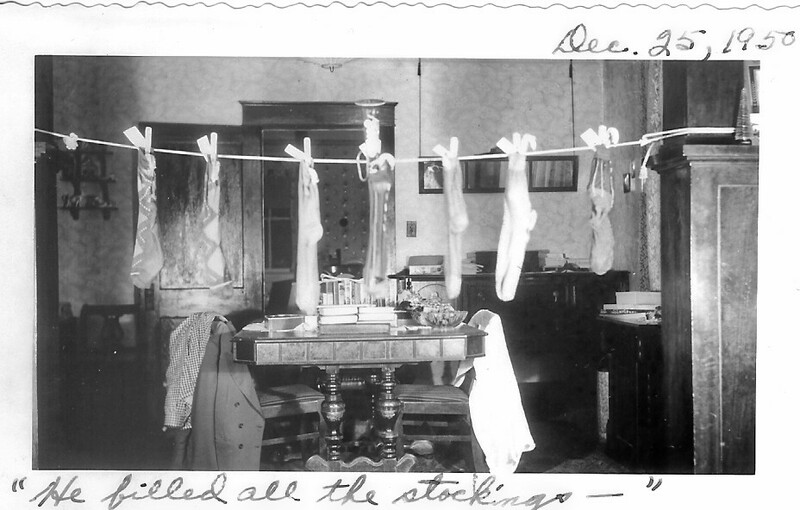 The Christmas stocking, hanging from the mantelpiece, bed post, or anywhere else (like the washing line above), is a Western tradition. The aim is to leave an empty stocking which, by magic, will be filled by the next morning with small toys, or tangerines, or sweets or chocolate coins in bright foil or anything else that can pass muster as a stocking filler. Apart from a foot that is. It is tied in with the folklore surrounding the character of Santa Claus or St Nicholas and, although the stories all vary slightly, the concept of St Nick as a gift-giver is common to all of them. 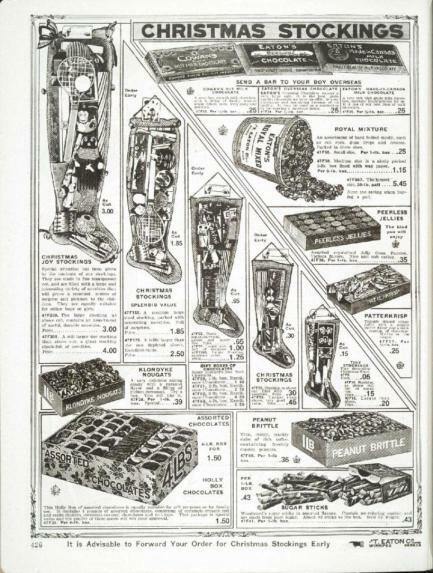 Although originally the stockings were likely to be those normally worn, some were created especially for Christmas and it didn’t take long for the commercial arm to work out that the idea could boost Christmas sales no end. Today Christmas in the Western world is a Commerce Fest but the image below shows that this is not an entirely modern phenomena as it dates from a century ago. Stocking fillers were intended to be cheap and cheerful gifts. There could be all sorts – but you rather hoped it wouldn’t be a piece of coal marking your naughtiness – and that’s what this School Christmassy stocking contains. The fillers, not the coal. This is a small collection, definitely not commercial, of unconnected stories related to the School’s history. The bulging stocking hangs tantalisingly. Let’s see what’s there. If you have been enjoying Blue Planet II with the inimitable Sir David Attenborough, you might be surprised to know that, but for a quirk of fate, it might have been the voice of Jack Lester. Jack – or more properly John Withers Lester – had been the curator of Reptiles & Insects at London Zoo. At that time, the usual way zoos acquired their animals was from expeditions and Lester had organised one such to Sierra Leone. David Attenborough had previously produced and presented a nature programme and during this he formed a friendship with Jack. He was then invited to go on the expedition, with a film crew, and, as Attenborough was very keen to film animals in the wild, he jumped at the chance. It was this expedition which formed the basis of the series Zoo Quest. The original idea was that Attenborough would produce the programme but that Lester would be the presenter. Unfortunately, Lester contracted a tropical disease from his trip to Africa and presented only one instalment before having to be taken to hospital. Sadly, after several recurrences, this was what caused his premature death at the age of 47 in 1956. Because the series was already scheduled, Attenborough had to take over the presentation. And the rest, as they say, is history. And the connection to RMSG? Well, Jack’s daughter subsequently became a pupil between 1957 and 1964. On the subject of zoo expeditions, someone who wrote entertainingly about them is Gerald Durrell. One of his expeditions was to what was then British Guiana, mentioned in the last post Bring Me Sunshine. In 1950, Durrell discovered the name Adventure on a map of Guiana and thought it sounded perfect as a starting point. “ ‘Three singles to Adventure please,’ I said, trying to look as nonchalant as possible. Continuing the animal theme – and equally as contrived – we have Emilie Hilda Nichols who was a pupil at the School in the C19th. This small item appeared in Horse and Hound: A Journal of Sport and Agriculture, on September 17, 1892. Applicants for the School had their names and details submitted by Petitioners and were then put forward to a ballot. This was circulated, voted upon and the totals added up. Those girls who received the most support were granted a place at the School (always over-subscribed) and those unsuccessful accrued their vote totals for the next ballot six months later. This could happen several times, unless the girl in question became too old to be accepted as a pupil (usually 10 years of age). It seems rather more unusual for something to appear separately, and additionally, in a publication concerning a particular child – a sort of belt and braces approach. It seems likely that ‘Retniop’ knew William Nichols; Retniop was writing for Horse & Hound and Nicholls was the editor of Stock Keeper and Fancier’s Chronicle, described as ‘A Journal for Breeders and Exhibitors of Dogs, Poultry, Pigeons, Cats, &c’ – their subject matters were similar. 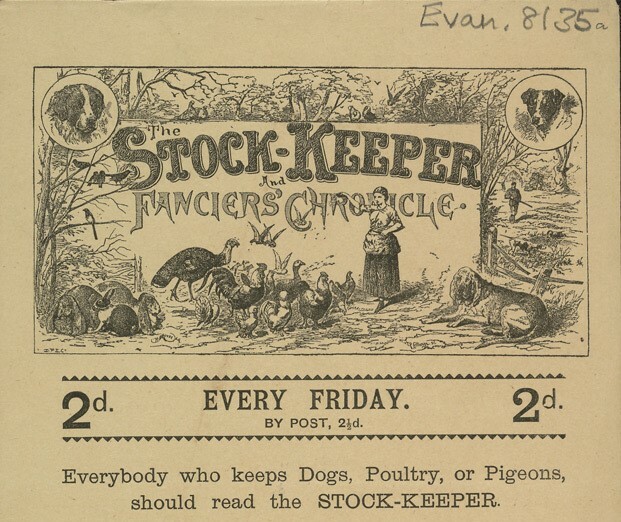 By the late 19th century, there were apparently over 400 periodicals devoted to agriculture alone, of which the Stock Keeper and Fancier’s Chronicle was one. Whether the newspaper appeal did the trick or not we cannot be certain, but Emilie did become a pupil. Born on 11 Oct 1884, she became a pupil after her father died in 1892. She left in 1900 but we know that she visited the School in 1912. She lived in Surrey all her life and died in 1952 unmarried, her probate being granted to her sisters Flora & Alice. As was customary at the time, neither of these two became pupils. 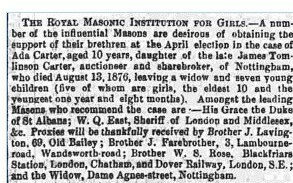 It was usual for only one girl (and one boy) of each family to receive a Masonic education although others were assisted in other ways. 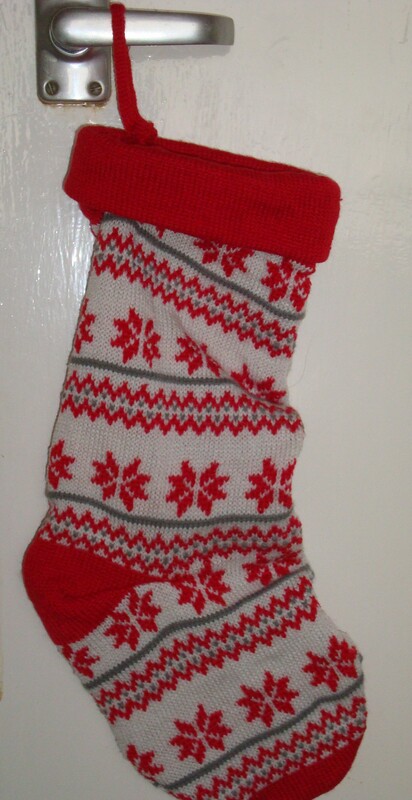 We’re turning the heel of the stocking now. Perhaps as evidence that there may be nothing unusual about individual girls receiving separate support in newspapers to encourage voters, Ada Carter received a similar treatment. Amongst its many contributors was Charles Dickens and so here we have another link with the School! Ada Carter was born in Nottingham in 1867. In 1864, her father, James Tomlinson Carter, was described as a gentleman who had been promoted to Lieutenant in the Robin Hood Rifle Volunteer Corps. He had a partnership with his father as auctioneers and share brokers, although this was dissolved by mutual consent in 1874. Whether this was because of his health we will never know but he died of consumption just two years later. As with Emilie, the newspaper support may have encouraged voters in the ballot or it may not. However, Ada also became a pupil and in 1883 she won a prize for General Usefulness. She left later that year “her brother having written for her.” By 1901 her occupation is given as sick nurse and she, like Emilie, visited the School on what was then called Ex-Pupils’ Day, in 1912. In 1915, she married David Alexander Robertson Jeffrey. In fact, the couple took advantage of a new law of consanguinity which had been passed in 1907 as David Jeffrey had previously been married to Ada’s sister Kate. David and Kate had had a son before Kate died and Ada became his surrogate mother until her own death in 1938. And so we reach the toe of the stocking. Is it a tangerine or a piece of coal? You can decide for yourselves because the last little filler brings us into the 21st century. The Year 7 Reading Group one December were told that they were being taken to see Santa Claus. The aim was to intrigue but they all became very excited at the prospect. Off we set for the Chapel where we found not a jolly figure in red crying “Ho ho ho” but a carved image of Saint Nicholas to one side of the altar connected with the diocese of St Albans in which the School lies. In the last posting (Could do better? ), we considered the somewhat poor school report of an early twentieth century pupil. It would, however, be unfair to look at this in isolation: the pupils attended the School in the first place as the daughters of indigent Freemasons and frequently this was as the result of the death of the father, as was the case of Adrianne Harvey. Adrianne’s parents, Arthur Edward Harvey and Kate Harvey nee Thorpe, had married on 28 Jan 1909 in Dover’s Holy Trinity Church and Adrianne was born on 11 January 1916 in Dover. 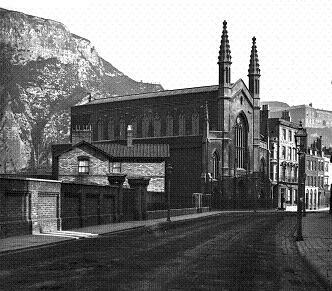 Image of church from http://www.doversociety.org.uk/history-scrapbook/churches/holy-trinity-church Date for the photograph is given as circa 1900. Kate was a Dover girl by birth and from ‘a long established Dover family‘ (Dover Express, 10 Feb 1911). Kate’s father, Henry William Thorpe, was a councillor and a magistrate. His father, William Thorpe, had opened a business in Dover at the beginning of the nineteenth century so the Thorpes were well established as a Dover family by the time Adrianne was born. Adrianne’s grandfather had been a town councillor for many years and may well have been appointed Mayor in 1902 but for the fact that his wife had died during the election. He had ’felt the loss keenly’ the Dover Express stated and, although he served the town as councillor, he did not contest the mayoralty. He had been appointed magistrate in 1892 and he was also Chairman of the Dover Overseers, a Director of Dover Gas Company, a sidesman at St Mary’s Church (where he was later buried) and Chairman of the Dover Promenade Pier Company, so he was fully involved in Dover life. The Express then goes into quite extraordinary detail of his funeral, not just listing the mourners but describing the vault in which he was buried alongside his wife and the coffin (polished 1½ inch English oak) and the flowers and the tributes and the undertaker … From which we can assume that he was indeed held in high regard. Although expected to mourn, women were generally advised against attending funerals, especially for those nearest and dearest to them. Arthur Harvey did not hail from Dover himself. He had been born in Bristol and was in Dover because he was the manager of the Lord Warden Hotel. However he too became involved in Dover’s affairs becoming a Councillor in 1920. Quite possibly he might have gone on to serve longer had not illness intervened. The Dover Express in 1924 reports his death in Felixstowe, where he had gone in the hope of improving his health, and indicated that his illness had been of some six months’ duration. Curiously, although still acting as town councillor in Dover, the newspaper notes that he left Dover in about 1921 and managed a hotel in Bexhill before then going on to successfully run the University Arms Hotel, Cambridge. 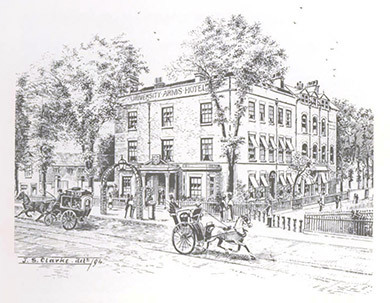 The University Arms hotel was opened in 1834 and is considered to be Cambridge’s oldest hotel. It has been recently restored – having been damaged by fire in 2013, dramatic pictures of which can be found at http://www.bbc.co.uk/news/uk-england-cambridgeshire-24379988 – and continues to operate as a hotel. But he was associated most with the Lord Warden Hotel. 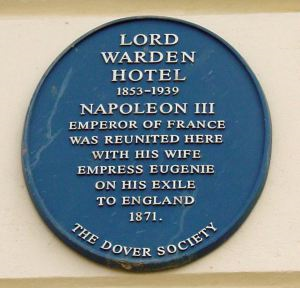 https://doverhistorian.com/2013/10/02/lord-warden-hotel-house/ carries a splendid history of the hotel written by Lorraine Senicle. Rather like the University Arms, Cambridge, the hotel was clearly intended to attract the wealthier customers, in Dover to cross the Channel and for onward travel on the Continent. For their convenience, there was a covered walkway from the first floor of the hotel to the train station. The hotel had been named after the Duke of Wellington, who had also been the Lord Warden. John Birmingham was its first manager. Among the many renowned guests was Napoleon III, the nephew of Wellington’s opponent at Waterloo. The Dover Society placed a blue plaque on the building to commemorate this. Another noted guest was Charles Dickens. It is amazing how often this man crops up in stories about the School’s history! It is thought that the streets surrounding Dover Pier District may have been the inspiration for the area of Tom-All-Alone’s in Bleak House. As well as its connection to rail travel, two other hotel guests connect the Lord Warden Hotel with flight. Louis Bleriot celebrated there in 1908 after his solo flight across the Channel. Just four years later, Harriet Quimby was a guest on 16 April 1912 before becoming the first woman to fly across the Channel. For the funeral of Queen Victoria (1901) and the coronation of Edward VII (1902), the European monarchs and nobility crossed the Channel and stayed at the Lord Warden en route to Windsor. By 1911, the hotel was of sufficient size and/or prestige to have 35 servants listed in the census. In June of that year came the coronation of George V and it is thought that virtually every room (about 100) was occupied by royalty or members of their entourages. 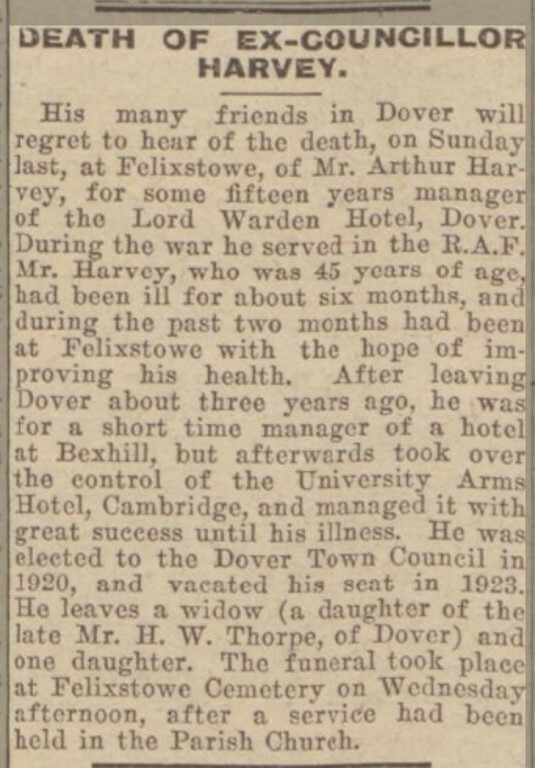 In the announcement of Arthur Harvey’s death, it states that he served with the RAF. This was only formed in 1918 from the Royal Flying Corps and as the hotel was closed in 1917 because of the war, it seems likely that Arthur at this point enlisted with the RFC, later going on to the RAF. 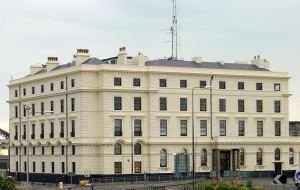 The Admiralty commandeered the hotel in 1917 and handed it back in 1919. It was refurbished by its owners and re-opened for business in 1920. Arthur, on leaving the RAF, probably moved on to the Bexhill hotel and then the Cambridge Hotel and never went back to the Lord Warden. Further refurbishment took place in 1924 but Arthur was not alive to see it. 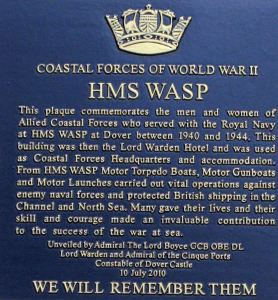 In World War II, the hotel was once again requisitioned and in 1940 became ‘the headquarters of the Coastal Force Base, HMS Wasp’ which ‘Lord Haw-Haw’ once famously announced had been torpedoed in the Channel! The hotel survived the war, despite being shelled, and a plaque had been installed on the building after the war but mysteriously disappeared. In 2010 another plaque was placed on the building. Although it was intended to re-open it as a hotel, by this stage it was somewhat battered and battle-scarred and the money needed to refurbish it just wasn’t available. It had been renamed Southern House and was used as offices. In 1990 Stena shipping group acquired the building as part of a wider franchise and when Roy Hattersley, in a 1992 Guardian article, was less than flattering about its decayed state, they perhaps felt stung into carrying out some exterior refurbishment. By 2007 it had been given a listed status and subsequently underwent more extensive repair work costing three quarters of a million pounds but it remains as offices today albeit its original name being partially restored as Lord Warden House. Adrianne would only have been a baby when the hotel was closed in 1917 although she may have been more aware of the University Arms hotel as this was presumably her home whilst her father was its manager. After leaving the School in 1932, she lived for a while in London. By 1939 she was in Salisbury and in Eastbourne by 1957. She died in Cheltenham in 1999 never having married and thus her story stops here.